Josephine Bolling McCall poses with a photo of her father, lynching victim Elmore Bolling, at her home in Montgomery, Ala. Bolling is among thousands of lynching victims remembered at the new National Memorial for Peace and Justice, erected with donations by the Alabama-based Equal Justice Initiative. The memorial and an accompanying museum, which aim to tell the story of racial oppression in the United States, open April 26. MONTGOMERY, ALABAMA. (AP) — Elmore Bolling defied the odds against black men and built several successful businesses during the harsh era of Jim Crow segregation in the South. 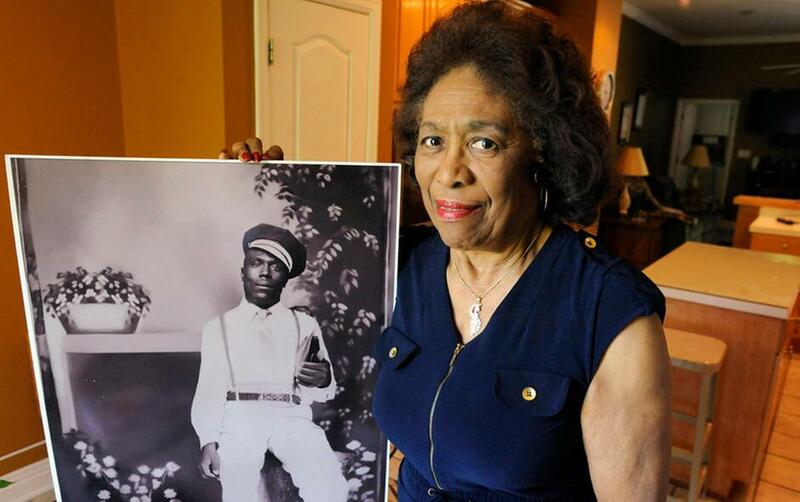 He had more money than a lot of whites, which his descendants believe was all it took to get him lynched in 1947. He was shot to death by a white neighbor, according to news accounts at the time, and the shooter was never prosecuted. But Bolling's name is now listed among thousands on a new memorial for victims of hate-inspired lynchings that terrorized generations of U.S. blacks. Daughter Josephine Bolling McCall is anxious to see the monument, located about 20 miles from where her father was killed in rural Lowndes County. The National Memorial for Peace and Justice, opening Thursday, is a project of the nonprofit Equal Justice Initiative, a legal advocacy group in Montgomery. The organization says the combined museum and memorial will be the nation's first site to document racial inequality in America from slavery through Jim Crow to the issues of today. "In the American South, we don't talk about slavery. We don't have monuments and memorials that confront the legacy of lynching. We haven't really confronted the difficulties of segregation. And because of that, I think we are still burdened by that history," said EJI executive director Bryan Stevenson. The site includes a memorial to the victims of 4,400 "terror lynchings" of black people in 800 U.S. counties from 1877 through 1950. All but about 300 were in the South, and prosecutions were rare in any of the cases. Stevenson said they emphasized the lynching era because he believes it's an aspect of the nation's racial history that's discussed the least. "Most people In this country can't name a single African-American who was lynched between 1877 and 1950 even though thousands of African Americans were subjected to this violence," Stevenson said. The organization said a common theme ran through the slayings, which it differentiates from extrajudicial killings in places that simply lacked courts: A desire to impose fear on minorities and maintain strict white control. Some lynchings drew huge crowds and were even photographed, yet authorities routinely ruled they were committed by "persons unknown." McCall, 75, said her father's killing still hangs over her family. The memorial could help heal individual families and the nation by acknowledging the painful legacy of racial murders, she said. "It's important that the people to whom the injustices have been given are actually being recognized and at least some measure — some measure — of relief is sought through discussion," said McCall. Combined, the memorial and an accompanying museum a few miles away at the Equal Justice Initiative headquarters tell a story spanning slavery, racial segregation, violence and today's era of swollen prison populations. With nearly 7 million people behind bars or on parole or probation nationwide - a disproportionate number of them minorities - the NAACP says blacks are incarcerated at a rate five times that of whites. E.M. Beck, who studied lynching for 30 years and has written books on the subject, said the memorial might actually understate the scope of lynching even though it lists thousands of victims. "I think it's an underestimate because the number and amount of violence in early Reconstruction in the 1870s will probably never be known. There was just an incredible amount of violence taking place during that period of time," said Beck, sociology professor emeritus at the University of Georgia. The memorial's design evokes the image of a racist hanging, featuring scores of dark metal columns suspended in the air from above. The rectangular structures, some of which lie flat on the ground and resemble graves, include the names of counties where lynchings occurred, plus dates and the names of the victims. The goal is for individual counties to claim the columns on the ground and erect their own memorials. The monument's April 26 opening will be marked by a two-day summit focusing on racial and social justice, to be followed by an April 27 concert featuring top acts including Common, Usher, the Dave Matthews Band and The Roots. McCall plans to view the memorial with her five living siblings. She says they suffered more than she did, since she was only 5 when their father was slain. A newspaper account from the time said the 39-year-old Bolling, who owned a store and trucking company and farmed, was shot seven times on a road near his store by a white man, Clarke Luckie, who claimed Bolling had insulted his wife during a phone call. McCall, who researched the slaying extensively for a book about her father, said it's more likely that Luckie, a stockyard employee, resented her father, who had thousands of dollars in the bank, three tractor-trailer rigs and employed about 40 people. "He was jealous and he filled him with bullets," she said. Luckie was arrested, but a grand jury issued no indictment and no one was ever prosecuted. McCall believes the white people who controlled the county at the time purposely covered for the killer, who died decades ago. One of Alabama's oldest black congregations, Old Ship A.M.E. Zion Church, sits across the street from the memorial. Its pastor plans to offer prayer and conversation to help visitors who are shaken by the experience of visiting the site. Church members have mixed feelings about the memorial, she said. They want to acknowledge and honor the past, McFadden said, but some are wondering how they'll personally react to visiting the memorial the first time. "It's something that needs to be talked about, that people need to explore. But it's also something that has the potential to shake people to the core," said Rev. Kathy Thomas McFadden. This story corrects that concert will be held April 27, not April 26.